Over the last decade or so, I’ve watched the emergence of a new generation of leading anthology editors. Folks like Jonathan Strahan, John Joseph Adams, Rich Horton, Ian Whates, and Jonathan Oliver. These are the editors who are successfully defining the best in the genre, and whose books I order immediately. And now, I’m very pleased to add Paula Guran to that short list. I sampled the fourth volume of her Year’s Best Dark Fantasy & Horror back in February, and was very impressed. The fifth volume arrived this summer, with an absolutely stellar line up of authors, and I nabbed it the first chance I could. 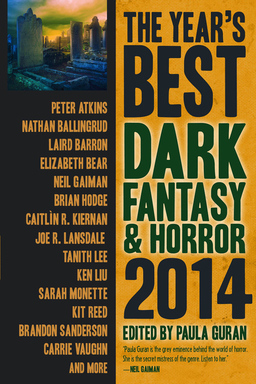 Year’s Best Dark Fantasy & Horror is the companion volume to The Year’s Best Science Ficiton and Fantasy, edited by Rich Horton and also published by Prime. We covered the 2014 edition of Rich’s series back in July. Together, these two volumes give you a comprehensive catalog of the best genre short fiction of the year. This year, the book contains fiction from Dale Bailey, Nathan Ballingrud, Laird Barron, Elizabeth Bear, Neil Gaiman, Glen Hirshberg, Caitlín R. Kiernan, Tanith Lee, Joe R. Lansdale, Ken Liu, Brandon Sanderson, Steve Rasnic Tem, Lisa Tuttle, Carrie Vaughn, and over a dozen others. It draws from the finest magazines in the field, including Clarkesworld, The Magazine of Fantasy & Science Fiction, Lightspeed, Subterranean Online, Interzone, Apex Magazine, Asimov’s SF, Strange Horizons, and Tor.com, and top-notch anthologies like Fearsome Journeys, Shadows of the New Sun: Stories in Honor of Gene Wolfe, Clockwork Phoenix 4, Dangerous Women, Queen Victoria’s Book of Spells, and many others. See why she’s rapidly becoming one of my favorite editors? 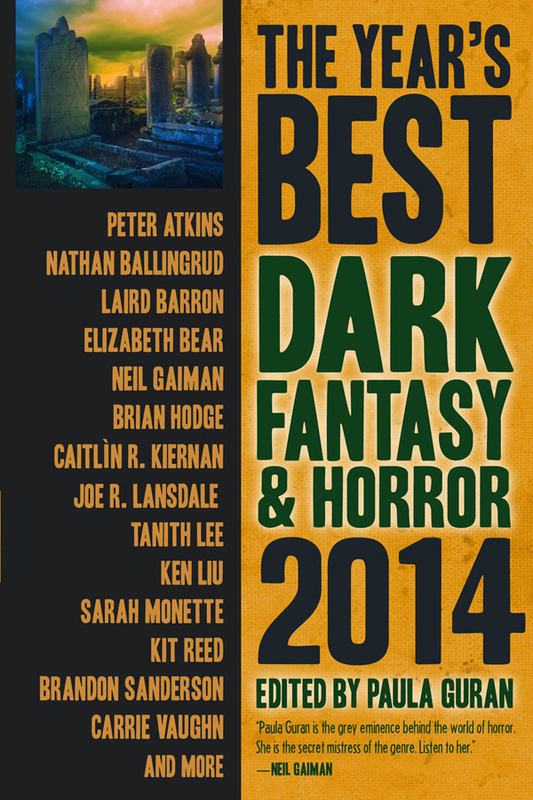 The Year’s Best Dark Fantasy & Horror 2014 was edited by Paula Guran and published June 17, 2014 by Prime Books. It is 575 pages, priced at $19.95 in trade paperback and $6.99 for the digital edition. The cover art is by Fer Gregory. Get more details or order a copy directly from the Prime Books website.